Product Key Finder is a free key finder program with one of the most simple interfaces to display product keys that I've seen. It finds the product key for many programs and lets you export the keys or copy them out individually. The program is also completely portable and works with nearly all versions of Windows. This review is of Product Key Finder v1.0 by OTT Solutions, released on July 12, 2009. Please let me know if there's a newer version I need to review. Product Key Finder couldn't be easier to use. 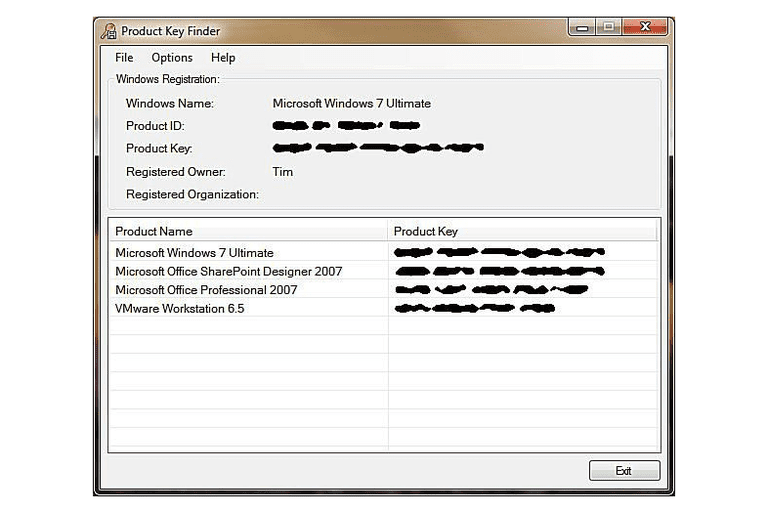 The program name and product key are displayed next to each other in an easy to read format. You can just double-click the program name to instantly copy the product key. I love that you can use Product Key Finder to change the Windows product key right from within the program, even in Windows 7, which many key finder programs don't allow. The only thing I don't like about Product Key Finder is that while it will open in Windows 8 and Windows 10, the displayed product key isn't accurate. This can be confusing because you may want to use Product Key Finder in Windows 8/10 but not realize it isn't supported until you try to use the incorrect product key it shows you. There are premium key finder tools and other free key finder programs you can use instead if this particular tool didn't find what you need.